Munich - Racing out into an early lead has been an all too common trend in FC Bayern Munich's successful history. This season, however, the record titleholders are often having to bide their time in picking up all three points and such was the case again in Sunday's 2-0 victory at VfB Stuttgart. "The most important thing was definitely that we never lost patience, despite the game remaining deadlocked for so long," explained Thomas Müller, scorer of Bayern's second goal, in an interview with bundesliga.com after the encounter. 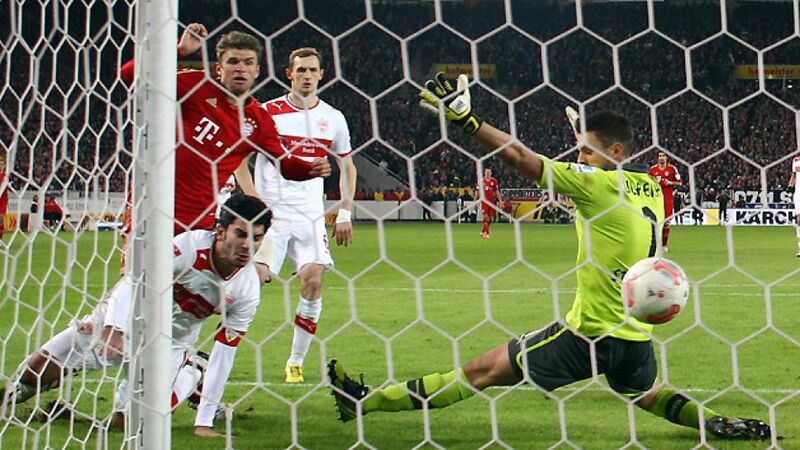 "Stuttgart put in a good performance in the first half, but they slipped up after the restart. Once we got the second goal though, we had a grip on the game." Bayern have been in indomitable form this season and, boasting an eleven-point lead at the top of the table, look well on course for their 22nd Bundesliga title. Hypnotic passing and a predatory ability to strike when opponents appear vulnerable have gone a long way to establishing the Bavarians as one of the most feared sides in European football. However, it's the improvement in defence that continues to provide the foundations for their triumphs this season. The league leaders have set a new Bundesliga record by conceding just seven goals in their first 19 games of the season, incidentally a best-mark previously held by their defeated southern rivals VfB. "We kept another clean sheet today and that's ultimately what matters the most," said the 38-time Germany international. "Even though VfB fought with a lot of passion, they never managed to find a way to break down our backline." "No opponent makes it easy"
Teams are now dropping deeper in anticipation of facing Jupp Heynckes' side, but while both Greuther Fürth and VfB Stuttgart have discovered that preventing the Bavarians from penetrating over the course of 90 minutes can be a near-impossible task, Bayern have not yet been firing on all cylinders either since the winter break. "Everyone expects us to be 3-0 up at half time, otherwise it means we've played poorly," said Müller. "Football in the Bundesliga isn't playground stuff. No opponent makes it easy for us and you can't always assume that we'll win hands down." However, the midfielder, who is understandably one of the first names on the team sheet after either scoring or laying on 18 of Bayern's 48 goals this season, did admit that there's room for improvement up front: "We can still do plenty more to hurt our opponents in attack." Müller has certainly been one of the shining lights in a star-studded ensemble at Bayern this season, responding to the critics who surfaced after what was deemed a below-par campaign on his part in 2011/12. "Things are looking really good for me right now," declared the 23-year-old. A constant threat in the final third and a source of perpetual motion, Müller's form mirrors that of the team as a whole. The oft-cited measures taken over the summer appear to have countered many of the frailties exposed over the previous couple of seasons and although Bayern are not scoring as often in the opening quarter-hour this time around, their ability to make the most of their plentiful possession was once again demonstrated at Stuttgart.